Frida was born in Sweden in 1977 and moved to London in '94 where she discovered an insatiable passion for design. After an interior design course and a short stint in apparel design, she knew her heart lay in the domain of jewellery. She has a passion for life's mysteries; she has travelled extensively and has a fond interest in the ancient world. Her affable nature blends easily into any new environment, thus allowing rare insights into a myriad of cultures. She draws on these diverse influences to infuse her work. 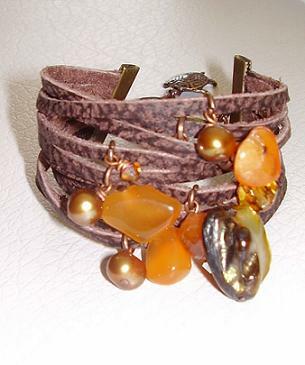 Her portfolio encompasses a wide range of materials- plaited leather, copper, antique silver, semi-precious stones, as well as unique objects found during her travels through dusty markets. Frida currently lives in Cape Town, South Africa, where she founded “Flashing the Family Jewels”, a charity that brings sanitation awareness into townships. I got to know Frida while I was looking for someone who could design an unique piece of custom made body jewelry for my wedding. 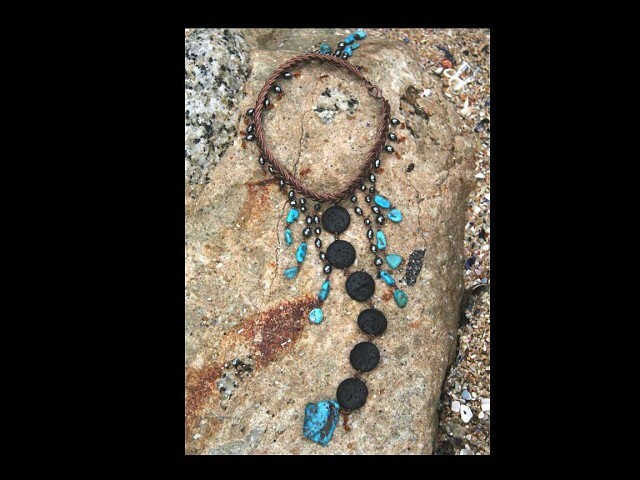 Most of Frida's custom handmade jewelry are one offs as they are custom made according to what the clients need and is looking for. 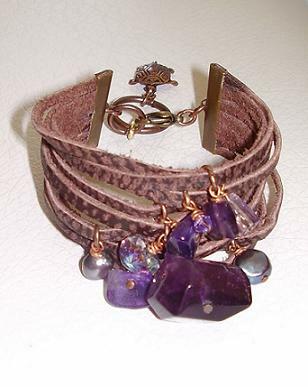 However, these are some of the custom handmade jewerly that she remakes as they are very successful. 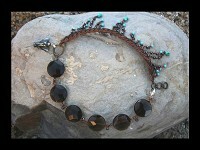 Smokey quartz, hematine angel, hematine, swarovski, turquoise. 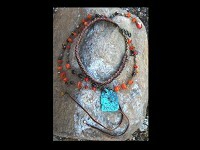 She also makes this custom handmade jewelry in blue with Turquoise and Swarovski. 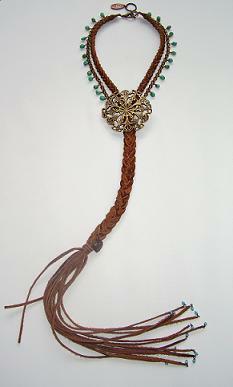 Turquoise and Swarovski, leather cow, bronze chain, antique brass centre piece, bronze heart, measures 50cm around the neck to the middle of the centerpiece, from the same point down also 50cm. 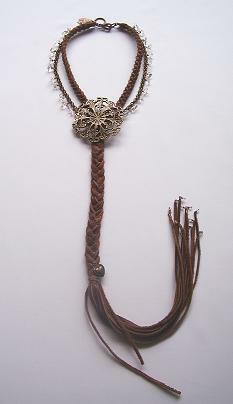 Crystal and Swarovski, leather cow, bronze chain, antique brass centre piece, bronze heart, measures 50cm around the neck to the middle of the centerpiece, from the same point down also 50cm. If you are interested in ordering any of this above piece, please complete the form below. Also, if you would like Frida to make a custom made body jewelry, please complete the form below and we'll work on a great piece together.